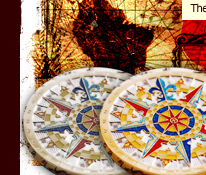 This is a functional quadrant coin which you can actually use to locate your latitude. The quadrant was quite simple in its early days and had many functions added after it was refined by surveyors and navigators. The simple method is for you line up one straight side and aim it at the pole star Polaris. Then the weighted plumb string dangling down intercepting the arc would indicate the degree of latitude. A more complicated method is to measure the sun's altitude at high noon and then using a navigational almanac and a little math to yield your latitude during the day. Later it also included deviation information and tangent marks. 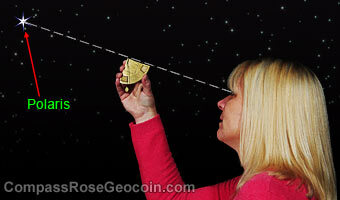 You could measure the height and length of something, your latitude, and much more. Used in conjunction with a nocturnal, you could also calculate a more accurate reading of your latitude. 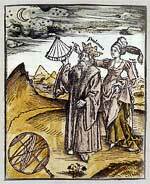 The use of a planisphere is most helpful to find the correct star to use. 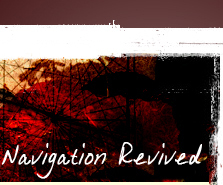 A nice feature of most quadrants is that navigators did not have to look directly into the sun to take a reading like was needed with the cross staff. Each of the two sights had a hole which you used to line up a beam of sunlight without looking though the sights. The quadrant design we made is based on a few different quadrants used in the 1300s; however, for manufacturing feasibility, the sights we have implemented are triangle points. Otherwise the holes would be too small for a quadrant this size. 1. Locate the North Star, Polaris. You can also use it in the Southern Hemisphere if you know how to triangulate the Southern Cross and Centaurus constellations to locate the southern axis point. 2. Hold the quadrant vertical and ensure there is nothing obstructing the weighted string. The weighted string must hang freely, but still lightly brush up against the degree scale. 3. Hold the coin straight out from your face; and line up the two triangle points on the edge of the coin with the North Star. 4. Once you have a good fix on Polaris, carefully pinch the lower end of the string onto the quadrant to prevent it from moving. Be careful to not pinch the string in a way that covers the degree scale. 5. turn the coin around and look on the degree scale to see where the string crosses it. You now have your approximate latitude. *Warning* Never look directly at the sun. Sighting the sun into your eye can cause blindness. We recommend you only use this coin during the night. 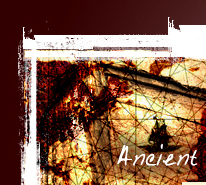 We tested the coin for several months by several people taking readings at various locations. 80% of the time they had readings within 1 degree of their actual latitude. This is pretty good considering its small size of 2.5" tall. 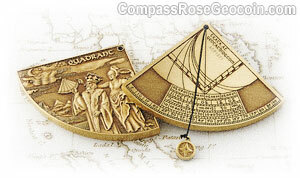 A life size quadrant is about 8" to 12" across and can be very accurate. 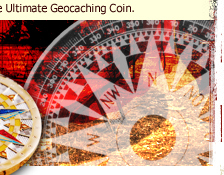 The Quadrant Geocoin™ is trackabe on Geocaching.com and has its own icon. It is available in antique silver and antique bronze finishes. There is a glass bead tied to the end of the string that comes through the back of the coin. 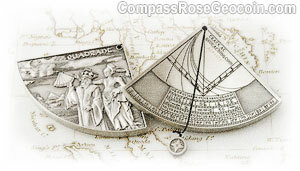 The 3-D image on the back is very detailed and depicts the quadrant's use.